The Raiders put together solid stretches Sunday against MSU-West Plains and had a chance to make a big comeback, but they were unable to hit some crucial shots in the clutch. Three Rivers cut a 21-point second-half deficit to six points with under a minute left in the game, and MSU-West Plains left the door open with a slew of missed free throws down the stretch. The Raiders, though, were unable to capitalize on those opportunities as a couple of 3-pointers rimmed out late and the Grizzlies hung on to win 89-82. 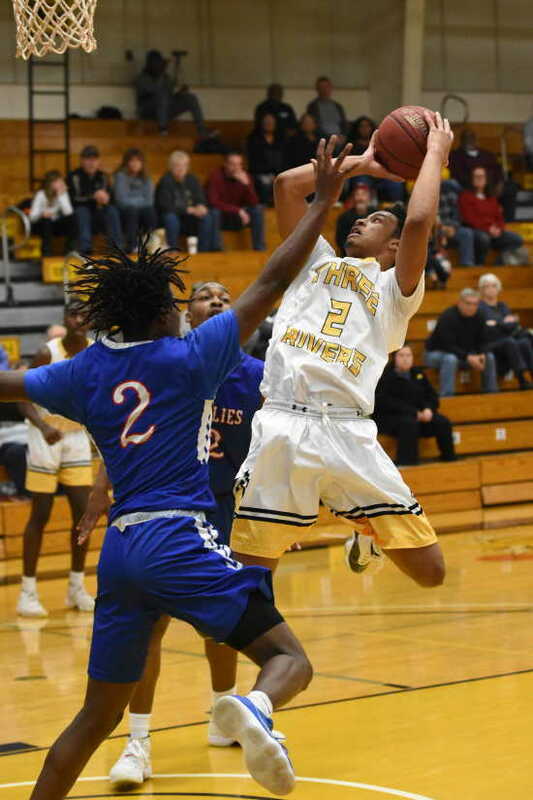 "I was glad that we fought back, and I saw a player or two kind of rise to the top, and we need all of that we can get," Three Rivers coach Gene Bess said. Trailing 77-56 in the second half, the Raiders went on a 21-9 run to cut the Grizzlies' lead to single digits for the first time since early in the second half. Three free throws from Hayden Sprenkel sparked the run when he was fouled on a 3-point attempt. After Tallon Fonda finished a layup with three defenders on him, Miganeh Jama finished a layup through contact for two more. Three Rivers' Tallon Fonda dunks the basketball during the first half of Sunday's game against MSU-West Plains at Three Rivers. 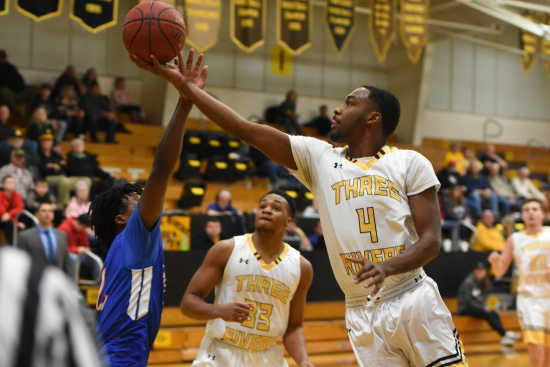 "We know they switched everything on the pick-and-roll, so we tried to do that as much as we could just to get the mismatch to where if we had the mismatch, we could use that to our advantage," Austin Parker said. Khalil Johnson became the second Raider to get fouled on a 3-point shot, but he buried his and completed a four-point play. Shortly after, he came up with a big offensive rebound and dished to Jama, who sank a free-throw line jumper. Parker scored the next five points on the run, and Jama capped it with a contested trey in the corner. "I've been trying to get (Jama) to where he'll settle down and get disciplined and contribute because he's pretty athletic and I could see him being a really important part of our program, and it was good to see him do that tonight," Bess said. 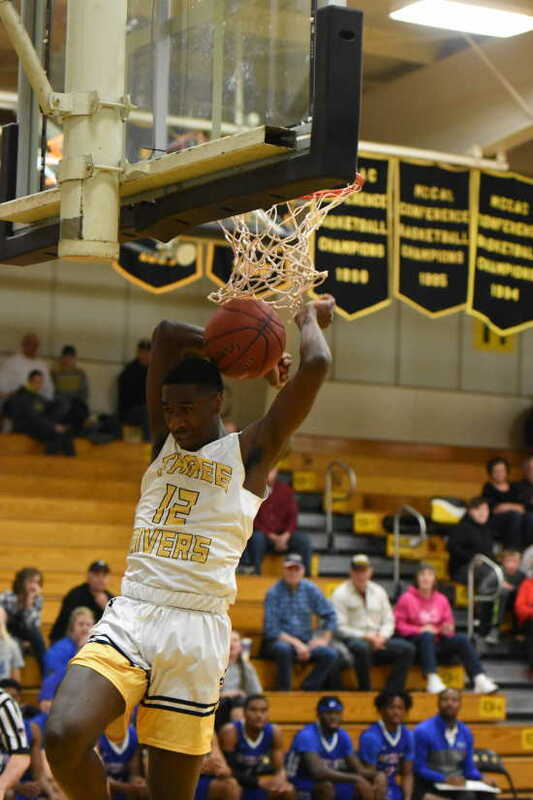 Burone Edwards broke the run and came up with a huge basket for the Grizzlies after he backed down his defender in the post and flipped home a basket to stretch the lead back to 11 with just over three minutes remaining. Jama drew a foul on a drive to the basket and looked to have a 3-point play coming on the ensuing possession, but the referee called the foul on the floor. Jama missed both free throws with 3:12 remaining, and then the 3s stopped falling for the Raiders until it was too late. Mandarius Dickerson provided some strong minutes down the stretch. With the Grizzlies leaving the door open for the Raiders with some missed free throws, Dickerson scored an and-one and followed it up by drilling a 3 on the wing to cut the deficit to six with 49 seconds left. Three Rivers' Mandarius Dickerson shoots the ball as MSU-West Plains' Dravon Clayborn defends during the second half of Sunday's game at Three Rivers. "(Dickerson) is pretty good with the ball in his hands until he gets to trying to do too much with it. On the defensive end, he's getting better, and I liked the way he played tonight at times," Bess said. Then, the Raiders' Achilles' heel showed itself once again. A Grizzlies player missed the front end of a 1-and-1 at the free-throw line, but Sardaar Calhoun came away with one of the biggest rebounds of the game, forcing the Raiders to foul him. He split a pair at the line, and Three Rivers was unable to get another shot to fall. "I feel like we all could've done a better job boxing out more. And starting with myself, I feel like I could've done a better job getting on the boards, so I mean as a team I feel like we should've done a lot better than what we did," Parker said. The game was tied in the first half before the Grizzlies closed on a 10-0 run to take control heading into the locker room, and when the second half started, they were able to build that lead to as much as 21. "We haven't quite decided who we are yet," Bess said. "We've got too many people who are searching, and I don't think anybody knows who we are at times. And we just don't play disciplined. That got us started down the wrong track right before the half." After a 2-0 start in region play, the Raiders have lost their last two against Region XVI opponents and their last three overall. The silver lining for the hosts is that five different players scored in double figures, a welcome sight for a Raiders squad with two healthy players averaging double digits in scoring. Tristan Jarrett averages nearly 29 points per game, and Tallon Fonda puts up 10.8 per night. Three Rivers' Tristan Jarrett (4) shoots a layup against a MSU-West Plains defender during the first half of Sunday's game at Three Rivers. Jarrett sat the first five minutes of the game after showing up late to a practice during the week, and the nation's leader in scoring average finished with 11 points in 25 minutes, his lowest output since Nov. 3 against Wabash Valley when he went scoreless in 13 minutes. Despite shooting 4 of 14, Jarrett distributed the ball well and tallied six assists for a game-high. The Raiders were minus-16 on the glass, though, including 16 offensive rebounds by the Grizzlies, and it proved costly down the stretch. Four Grizzlies scored in double figures, led by Calhoun with 18 in 28 minutes. Dravon Clayborn totaled 17 points, seven rebounds and five assists in a game-high 36 minutes. Evan White added 15 points and six rebounds, and Alex Peterson scored 14 on an efficient 7 of 9 clip from the floor. For the Raiders, Jama led the team with a season-high 16 points and 31 minutes. Parker went 6 of 7 from the field and scored 15 points in 17 minutes, and Fonda added 12 points. Next up for the Raiders, they'll visit Arkansas Baptist at 7 p.m. Tuesday.